Keith Ahlers and his Team Aero Morgan will be back for another crack at British GTs this season – and Oliver Bryant will be sharing the car (in the GT Cup Class) for a second season. The Morgan finished every race it started in 2005, and for the new season, the suspension has been upgraded, to make the best use of the Avon tyres. Ahlers’ relaxed, but very serious, approach to his racing has found a good match in the younger Bryant – recently voted dsc’s Rookie of the Year in the UK. Unfortunately the internet hadn’t been invented when Keith Ahlers made his racing debut! 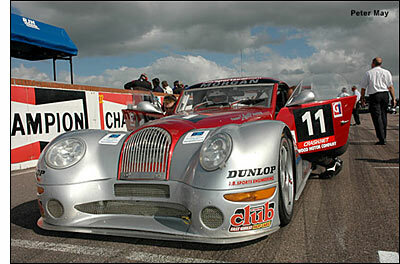 “Last year we proved the Morgan was a winner and I’m sure we can do it again,” said the ROTY. Oliver Bryant has other plans too this year, which are likely to include the FIA GT3 Championship – plus selected LMS races, and the Le Mans 24 Hours (in a prototype). 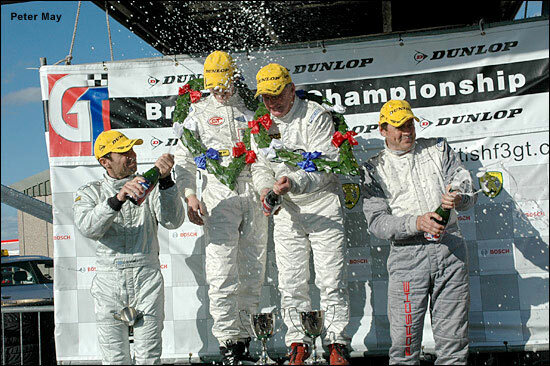 He and Keith Ahlers took two wins in the 2005 British GT Championship, in the Sunday races at Thruxton and Mondello Park. They’ll again be up against a fleet of Porsches again this season. It’s great to have the Morgan back. Here they are after that first win, at Thruxton last May.